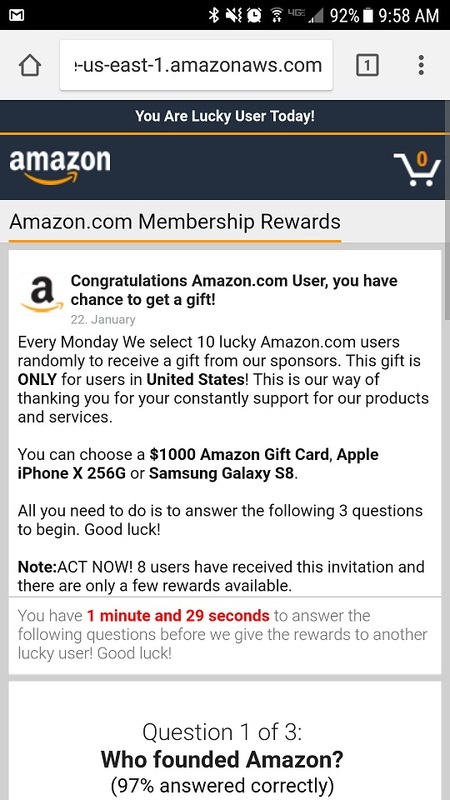 I was on a legitimate news website the other day in early 2018 on my Android phone (this also affects iPhone and desktop computer users) and up popped up a message for “Amazon Membership Rewards”. This is NOT a legitimate message; the website is impersonating Amazon. Congratulations Amazon.com User, you have a chance to get a gift! Every Monday we select 10 lucky Amazon.com users randomly to receive a gift from our sponsors. This gift is ONLY for users in United States! This is our way of thanking you for your constantly support for our products and services. The message then offers a fake time limit to respond. 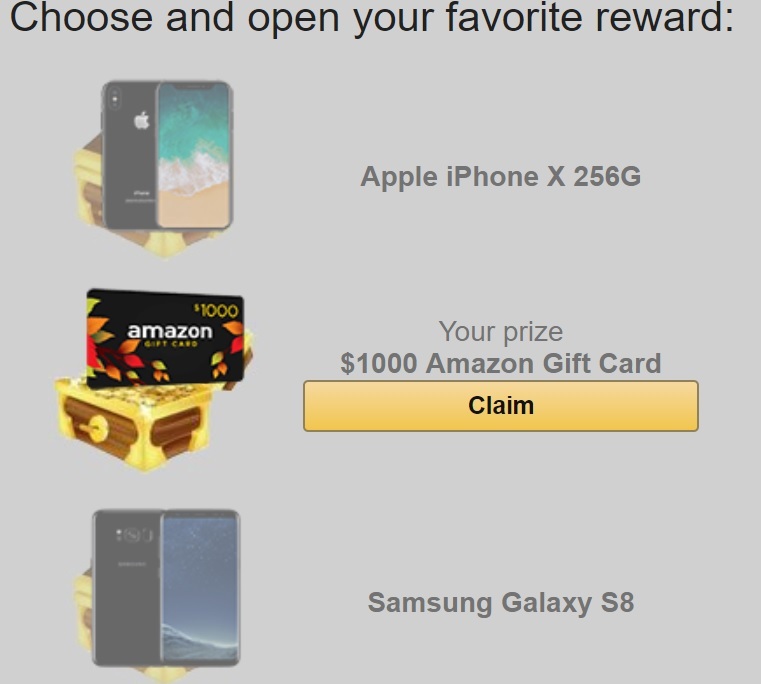 The message is very poorly written but some people think the iPhone X, Gift Card or Galaxy S8 giveaway is the real deal because they see “amazonaws.com” in the URL. This is because the scammers have taken advantage of Amazon “buckets”. Without going into too much detail, you can host a file in a bucket and you get a URL which looks like one of Amazon’s. Why is my local news website hitting me with spam? I wrote about this in January 2017. Unfortunately, most publishers are desperate to make money and will let questionable advertising networks post ads on their site. Sometimes these advertisements are pushing out malicious software which can steal bank account information, plaster your laptop with ads, trick you into taking surveys or infect your cell phone. For more information please read: News Websites Accidentally Showing Fake News. Some people call these survey scams or survey spam. 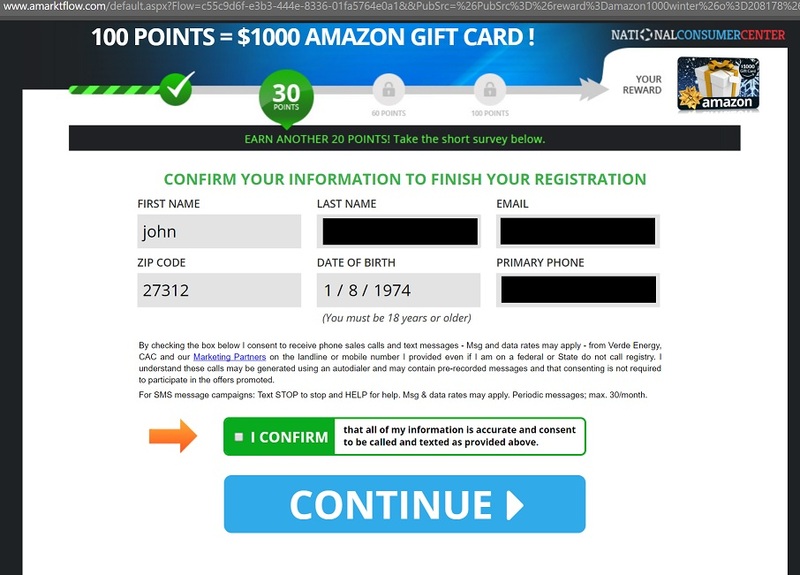 For the sake of this article, I decided to play around with the scam and pretend that I was taking the bait for a $1,000 Amazon Gift Card, iPhone X or Samsung Galaxy S8. First, I was given a quick quiz, which asked me 3 simple questions, such as “Who is the President of Amazon?” (Jeff Bezos, of course). If you haven’t heard of them, this is the infamous “National Consumer Center” survey. This takes you down a rabbit hole of answering 100 questions. If you use your legit phone number and email address, you will later receive dozens or possibly hundreds or maybe even thousands of “offers” in the mail, by phone, by email and by text. If you haven’t guessed by now, you’re probably never going to meet the requirements needed to get a free $1,000 gift card or an iPhone X or a Samsung Galaxy S8. This survey has been around the net tricking users for at least half a decade now, if not much longer. Did you get tricked by this? Pick prize B, and I can’t claim my card. Right. You could pick A, B, or C, but you will probably only be signing up for lots of spam. I wouldn’t hold your breath waiting for that $1,000 gift card. Oh, by the way, I took the test three times and each time I clicked on the different prizes but it always came back that I won the $1000. gift card so I guess they ran out of iPads and iphones. you are so right. I clicked and there was no where for me to enter my info get this so called $1000. gift card. So I decided to go on computer and check out only to find this is a scam. If people used their time to be more productive to help poor people who are desperately in need they would be better rewarded. But they then have all these people who claim to have received their gifts. Thank you for putting this info about this scam out there. Wow. I saw this too just a couple days ago. I wasn’t sure where it came from. I just cleared my phone’s browser cache. I’m almost surprised it came from news advertising, except that I’ve been seeing some pretty hefty garbage advertising in general on news sites these days. This happens to me all the time while I’m trying to read an article online and it is super annoying. Is there any way to get rid of it so I can continue reading the article? I received the scam when I cleared my phone’s browsing history for the first time. I think the comment above mine is on to something. Your phone shouldn’t be hacked, but I would expect the calls to continue..
Twice I have cleared the cache, browser history and cookies on my Samsung Galaxy 7 Edge. I still have it. It’s the website you are visiting.. That’s what the article above is about! Well, I got suckered in and completed the survey and actually received a card from netspend although it was an amazon pop up. It’s a cash card but with a zero balance. They want you to add money to the card or set up direct deposit. I did activate the card but I don’t plan on adding any money to it . Should I be concerned about this ? Is this the same scam as the amazon gift card? I did it because I was curious on where this would lead to. I left them my number, email, and address and now I feel dumb for doing it. Should I be worried, especially with leaving my address.. This happened to me just now. 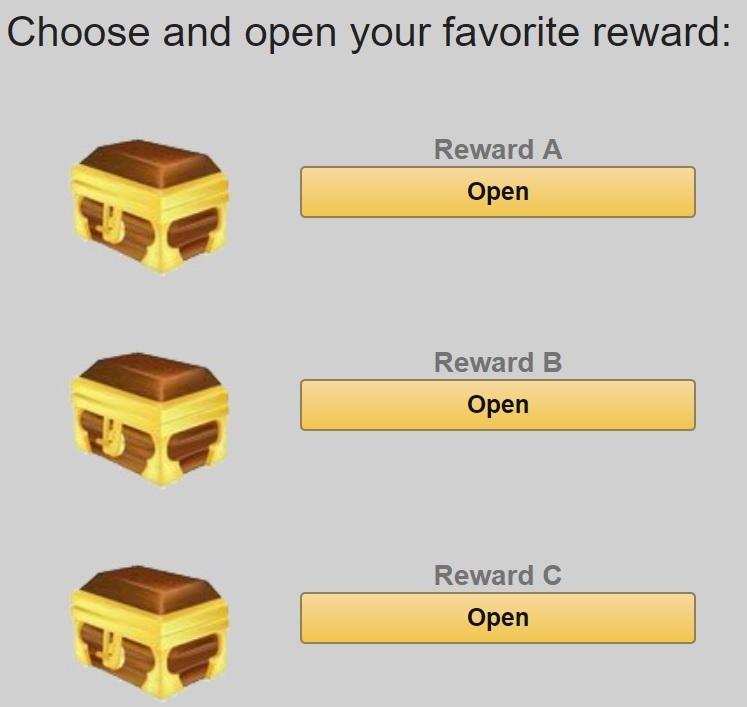 I answered the questions then picked treasure box B which was the $1000 Amazon card, i moved along to the point where it wanted my e-mail. then my better judgement told me that nothing is this easy and the old adage that “nothing is for free”, so i ended the farce. Im happy i found this page to reinforce my gut instincts. I left my email before I closed the tab, then cleared my history. Will my phone/email be safe??? No because it is already submitted to the website. I have found, that clearing the cache isn’t enough. I have a habit of closing my browser by continually tapping the “back” key on my phone. Doing so, reloads the page in my cache. So the better way is to 1.close the popup, 2.go to your home page, 3.at that point, clear your cache, 4.and finally, close your browser by using the “apps” button on the bottom left side of your Android phone. Hope this helps. Not certian about the book offer, but you’ll know if the offer was legit when (or if) you get the books. You could call your card company and see if you could get a “monitor” put on your account, if you’re worried. Me too! Did you ever get gift card or books? Thank you for this site! A relative said to check on the net to see if this is a scam. I had chosen prize 3 as depicted in your images. 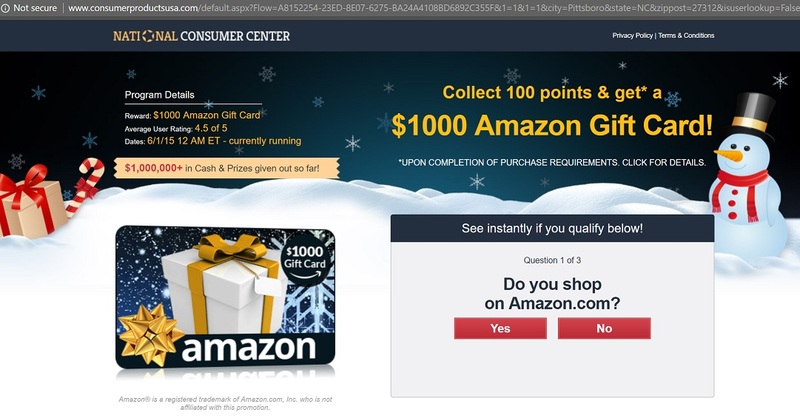 I “won” a $1000 gift card and was just about to enter my e-mail as part of the scam, before checking the web and finding your site. Thank you! Thank you Len for clarifying this scam. I used the google website check and it seems clean. But the offer just seemed too good to be true and smelled “phishy” to me. Re-googled it and found your post. Keep up the great work buddy! I knew this to be a scam. Good to have found your article to confirm it. Thanks much. And you’re a cute German Shepherd lover. Picked my prize which only one left was the gift carx. I filled in my info, and as I was beginning the survey, it was alot of political and personal questions. I clicked out of the website. I got suspicious. Now…will get.calls and messages and mail from these crooks? I fell for it, too, and claimed the prize after reading the comments about how it was “at first looked like a joke but it is the real deal!” I got as far as inputting my email into the website. What will happen? According to some part of security experts, these “surveys” are displayed by adware viruses hiding inside the system. Once they infiltrate computer, they modify web browsers and start causing these ads. However, information which is collected with the help of such scammers usually does not include personally identifiable details, such as financial data and so on. The only danger is receiving more spam emails that might be used for the distribution of malware or stealing personal data. I fell for the survey on my iPhone. Every time I went on one website on Safari browser for research the survey kept popping up. No matter how many times O closed out the page and brought it back up. Should I change my information or need to get legal help for identity theft? Or is it just going to be a bunch of spam calls and emails? I am freaking out because I did give information, but as long as I ignore spam mail I will be ok? I just did it….lesson learn next time to Google first before falling for it. I thought it was Amazon because I shop from them. Lucky I entered my junk email and a house phone line (that at least illimate the text alarts). I am so thankful to found your site/blog. I was worried to death that my iphone would be compromised after taking the “Amazon” quiz and “winning” the 1k gift card. The popup took me by surprise; we happened to be searching around on Amazon for Prime deals (although I’m not sure what site I was on when when this popped up on my phone. Since Amazon was on our minds, I hastily thought it was legit and I even had my attorney husband look at it and he said oh it looks like it came from Amazon – looks okay. After “correctly” answering the 3 questions and winning the gift card and a celebratory few musical notes sounded, I looked for instructions to redeem the winning gift card. When it wasn’t obvious and the note still said there had been 49 winners, I started getting nervous that I might have been scammed so I did not click on the “Choose and open your favorite prize, Claim ($0) button). I am so thankful to have read your step by step of this fake “Amazon” prize otherwise I would have been up all night worrying that everything on my phone had been hacked by a stupid impulsive act. I am usually very cautious and warn my husband well. Did I stop in time to avoid any further spams, etc from this fishing site, since I didn’t enter any personal info – only clicked on the 3 quiz answers and the gift choice? and the site acknowledged that I won? Just been on Amazon sorting out an order then what looked very much like an Amazon page popped up saying I had been selected out of 10 people for a prize, (through Amazon Partners). Thought it was genuine so answered the questions which I got right, I chose a box to open and won an iphone X. You’re then taken to another website (://junebox.club/iphonex/en5…..)asking you to create a login and pay £1… that’s when alarm bells started ringing and I googled the scam. Thanks. So how do I remove this virus? I cleared the cache as described in one of the forums, but it still keeps popping up. I am using an Android phone. It’s the site you’re visiting. Help!! I fell for it, right up to when it asked me how I pay for my online purchases. A bell went off when the they asked a Trump policy question; but I was doing something else as the same time, and on I went. I really woke up when they asked how I pay for my online purchases and I closed out. They have all the rest of my personal information. Is there anyway I can get it back from them? Probably not. How can I best protect myself form, or minimize, the onslaught of mail, email, texts, and calls?? I do everything i put my number, e-mail and i answered the questions randomly. Im worried now. Am i safe?? Is my phone safe ?? I delete the historial is that enough ?? email address and my birthdate. Nothing more. What is the worst I should expect? Spam. I wouldn’t worry about it. Don’t be embarrassed, hundreds of people read this article every day! As stated above, those are NOT comments. They just look like comments. Omg I fell for it! I used my actual email and phone number! I can change my email but not my number. What should I do?! I’m only 13 years old! If my dad finds out he’ll kill me! Am I gonna die because I put in my address? Is someone going to kill me in my sleep?! I had a really hard time falling asleep because of this. Please help me find out what to do. I fell for it as well, but stopped after I already gave name, birthdate, home address and email. Since I didn’t complete the survey, will my info be kept?